Alamosa Public Library is pleased to announce a partnership with Great Sand Dunes National Park and Preserve to bring you a new program on Alamosa Elementary’s early release days! 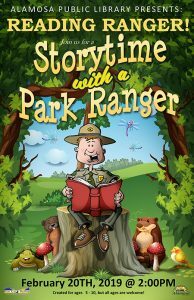 Reading Ranger is a traditional story-time program that introduces children to what a Park Ranger does in the community. 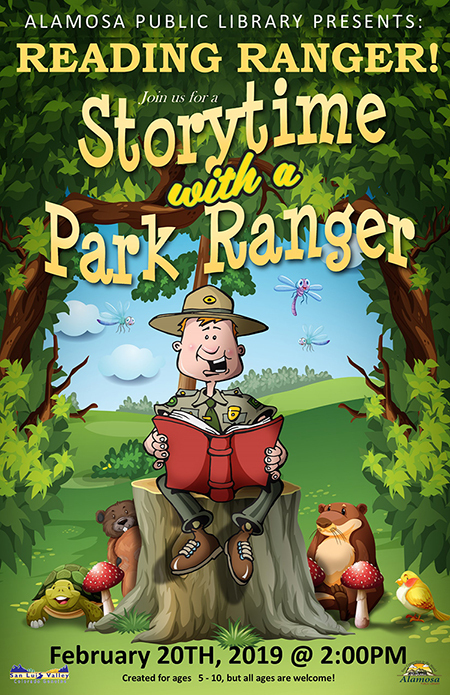 The 30-minute program focuses on the Ranger’s passion for the library and, using books about the area’s plants, animals, cultures, history, sky, Great Sand Dunes, and the National Park service—seeks to inform children about the natural world right in their backyard! The program will kick off on Wednesday, February 20 at 2 p.m. in the Alamosa Public Library Story Room. A session is planned for March 6 as well. This program is geared toward children ages 5-10, but all ages are welcome! No registration is required.